The Eye of Darkness is a juggernaut class warship for the Substrate. Juggernaut Destroyer - The pinnacle of Substrate's technological superiority, ruptures the fabric of spacetime to destabilize targets at the molecular level. Has an area of effect damage with armor-piercing, strong against all ground targets but lacks anti-air. The Eye of Darkness is a juggernaut destroyer and anti-ground powerhouse, capable of decimating all ground targets. The Eye of Darkness only has a single weapon, affectionately named "Attitude Adjuster" by the PHC. It fires a deadly beam which explodes in a wide area of effect, which negates all armor making it deadly against all targets. The Eye of Darkness lacks any form of anti-air, making it vulnerable and can't duel a Leonidas directly. Shoots out mysterious dark energy to rupture the fabric of spacetime. Tears apart targets with wide area of effect, ignoring all armor. The "Eye" is arguably regarded as the best Juggernaut in the game. Despite having what seems like a very serious weakness (zero anti air capability), the Eye is able to decimate any lower tier armies with ease, having problem only with the Leonidas. However, a Juggernaut is usually supported with lower tier units armies, and a Leonidas usually finds itself standing alone fighting against an army after the Eye has launched a few shots, clearing away significant amount of the Leo's supporting army. 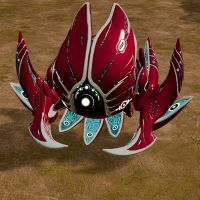 The Eye however, can be swarmed by lower tier armies due to having very low rate of fire. This can be negated by having a support army or better yet, having more than one Juggernaut on the field (which requires a massive economy to support). Despite having a single AoE weapon, the Eye still has immense single target damage, as a trade off for the small AoE of the weapon. This nature of the weapon makes the Eye easily mistaken as the equivalent of the Agamemnon as the AoE-clearing Juggernaut, which it is not. This does not imply that the Eye can duel the Leonidas, it cannot. In fact, no ground unit can do so. The Eye with a proper support army that compliments its weaknesses is extremely hard to stop and must be scouted early to gather a proper response. Even with a proper response, expect heavy losses due to the AoE nature of the "Attitude Adjuster" weapon. This page was last edited on 25 February 2019, at 04:03.